Honduras suspended diplomatic relations with Argentina on Tuesday in retaliation for having its ambassador expelled from Argentina last week. The move stems from tensions between the two countries over a June 28 military-led coup in which Honduran President Jose Manuel Zelaya was replaced by congressional leader Roberto Micheletti. When Honduran Ambassador Carmen Eleonora Ortez Williams, who had been appointed by Zelaya, did not protest the coup, Argentina took exception. Most countries in the world — as well as the United Nations, the Organization of American States and the European Union — have denounced the coup and demanded that Zelaya be restored to power. Those nations still consider Zelaya president and do not recognize any officials from Micheletti’s government or any functionaries who support him. Argentina asked Ortez to leave last week “for supporting the de facto government of Roberto Micheletti.” On Tuesday, Honduras suspended relations with Argentina and asked the South American nation’s diplomats to leave within 72 hours. Honduras’ relations with Argentina will be “channeled” though the Argentine embassy in Israel, said a release issued in Tegucigalpa, the Honduran capital. 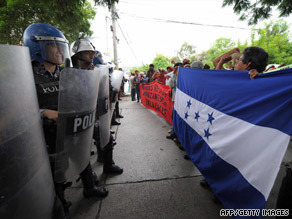 “With regards to Argentine personnel stationed in Tegucigalpa and who are finishing their functions in Honduras, they will be granted, based on the principle of strictest reciprocity, the same treatment, time and facilities that was conceded to Honduran functionaries accredited in Argentina,” the Honduran release said. The Honduran political crisis stems from Zelaya’s desire to hold a referendum that could have led to extending term limits by changing the constitution, despite the country’s congress having outlawed the vote and the supreme court having ruled it illegal. Zelaya vowed to hold the vote anyway but was ousted before the voting started. The congress named Micheletti provisional president shortly after Zelaya was detained by the military and sent into exile. Micheletti said Zelaya was not overthrown in a coup, but rather removed from power through constitutional means.